The most concise and authoritative introduction to the principles of toxicology and how poisons affect the human body -- now in full color A Doody's Core Title ESSENTIAL PURCHASE for 2011! 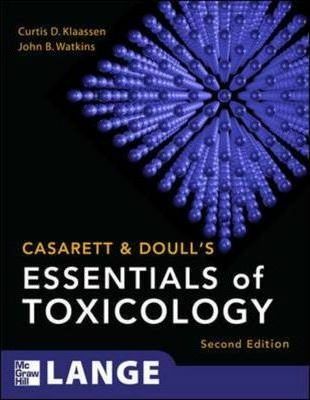 Casarett & Doull's Essentials of Toxicology is an easy-to-absorb distillation of the field's gold-standard text Casarett & Doull's Toxicology: The Basic Science of Poisons. Presented in full color for the first time, the book combines an accessible and engaging approach with coverage of essential introductory concepts to provide you with a solid grounding in basic and medical toxicology. Succinct, yet comprehensive, the text covers essential principles, toxicokinetics, how toxic effects are passed on to succeeding generations, how each body system responds to poisons, and the specific effects of a wide range of toxic agents -- from pesticides to radiation. Features: A complete basic overview of poisons and their clinical management Reflects the expertise of more than fifty renowned contributors A summary of important points is included at the beginning of each chapter and multiple-choice review questions appear at the conclusion Important chapters on forefront topics such as Analytic/Forensic Toxicology, Clinical Toxicology, Occupational Toxicology, Air Pollution, and Ecotoxicology Condensed Table of Contents: General Principles of Toxicology, Disposition of Toxicants, Nonorgan-Directed Toxicity, Target Organ Toxicity, Toxic Agents, Environmental Toxicology, Applications of Toxicology.